Being Military families, patriotic holidays like the 4th of July, Memorial Day, and Veteran’s Day are pretty special to us. It means more than a picnic and fireworks when you and your dear friends are the ones who make the sacrifices that make this country what it is. With that said, we knew we had to have an AMAZING freebie for you to use for all of your patriotic decor! We took the Pledge of Allegiance and layered it onto a rustic American Flag. It doesn’t get much more American than that! This patriotic word art would look great framed on a gallery wall or as decor for a mantle. We would love to see how you use it! Feel free to upload pictures on The Pinning Mama Facebook page! (If you aren’t following us, you should! We have exclusive free printables just for our FB Fans!!!) Or show us by tagging The Pinning Mama on Instagram (@thepinningmama). 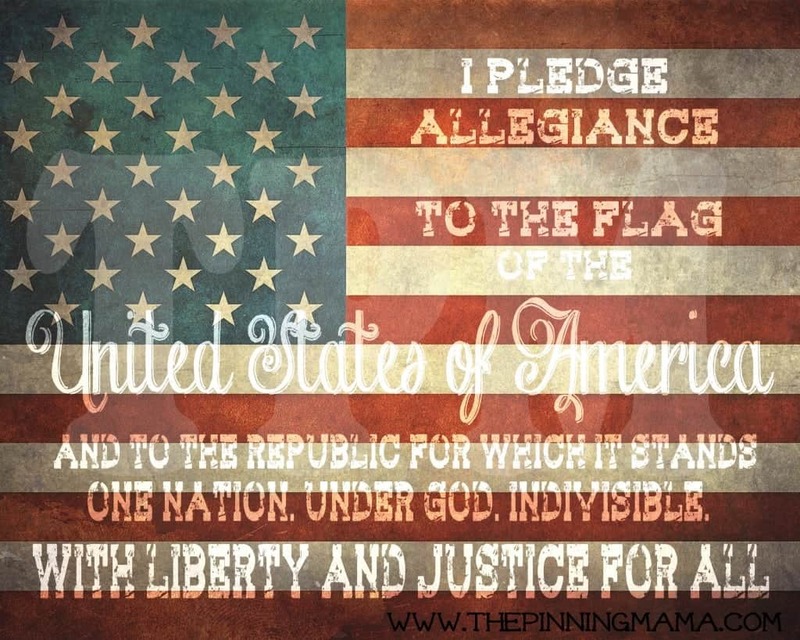 You can find the download instructions for the Patriotic Printable here. Also, follow us on Pinterest to see the Free Printables we are pinning from all over the web! You can see the rest of the 2013 Seasonal Collection by The Pinning Mama here. I never received a link with my email subscription to your blog for the 4th of July printable. Could you email me the link please! Hi Laura- It looks like you just signed up today and our welcome e-mail was sent out just a bit ago. Check your inbox and spam folder to see if it went there. You should see an e-mail that says Welcome to The Pinning Mama- Your Freebies are Here! Let me know if you don’t see it and I will resend. I am glad you love the printable, we do too! Love this!! Pinning it!! Thanks for sharing this week on DIY Showcase!! So glad you love it Shelly! It is one of my favorites too! We have lots of other freebies on the site so make sure and check them out using the freebie tab at the top of the page! Loving your blog! Am I too late to be able to print the seasonal art? Just sign up for the email list and you will get an email with the link to download everything! I would like to get your free downloads, thank you!